Abstract: Michael the Brave was a Romanian prince, one of the greatest personalities of the Romanian history, who lived during the sixteenth century. Ever since he ascended the throne of Romanian, Michael the Brave was concerned to unite under one helm the three Romanian provinces. 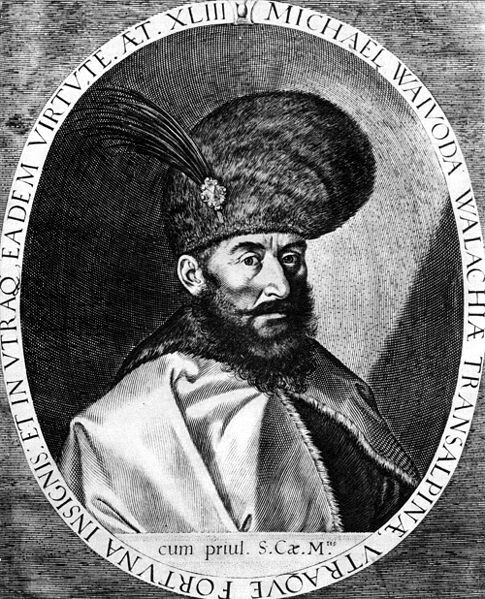 He fought for the emancipation of the Romanians from under the Ottomans and Habsburgs, for the recognition of the Romanians from Transylvania region as a recognized nation before the joining of the Transylvania to the ancient territory and for the recognition of the Orthodox confession in the places where the Romanians were not politically recognized. He was the first one to unify the kingdom of Romania, in 1600, but unfortunately, this unity didn’t last. The only thing that lasted was his thought for the descendants, for the followers, that Romania has to be unified. What made Michael the Brave took a few years, but remained in the minds of the followers as a goal for which generations fought and finally achieved in 1918. The short reign of Michael the Brave left deep traces in the Romanians’ history and especially in the hearts of the Romanians from everywhere, who have believed in the restoration of the ideal of unity of the Romanian state. Who was Michael the Brave? He was born in 1557 or 1558 and was long time considered the illegitimate son of Prince Pătrașcu the Good and of Lady Tudora from Cantacuzino’s genealogy. Besides the Romanian language he spoke Greek and Turkish fluently and lived many years in Constantinople, also, travelling a lot. He never met his father but rose in various cities of merchants1 . He was also a very good diplomat, managing to keep abreast of international events, especially going to create lasting relationships in Europe not only in Constantinople. He had relatives who lived in Istanbul (Ianni Banul, Andronikos Cantacuzino, etc.) who helped him with money in order to receive the throne of Wallachia, as it was the custom of that period. Before receiving the throne he has held various other duties, including the most important one, that of the Ban of Craiova. After he became ruler sought to establish solid links with the Prince of Moldavia and with the Prince of Transylvania. In this period there were several Balkan liberation movements of peoples in the Balkans and Michael sought to have connections with their leaders to coordinate the implementation of his political plan. In the first phase, he aimed to remove his country Wallachia, from Ottoman suzerainty, presenting his case as a Christian one and the immediate response was the war with the Sublime Porte. He initiated a long correspondence with Pope Clement VIII (1592-1605) who wanted to start a new crusade, and worked hard to get help from big European chancelleries, he received help several times, but in turn, Michael the Brave had to help him with money or soldiers in other circumstances. Did people in the Middle Ages take baths?